I really think Kaylah has the best giveaways in the world, and this one is absolutely amazing! 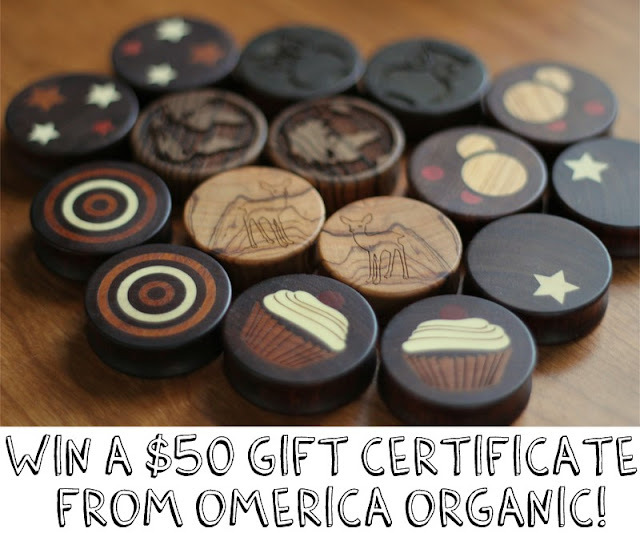 I'm dying for some Omerica Organic plugs, and they would be the perfect treat since I'm stretching again, so once I reach my 1/2" goal I was going to buy myself a pretty pair! Go here to enter the giveaway! OmericaOrganic doesn't just sell plugs, they have other awesome accessories for you unstretched folks!! I'm stretching too and my goal is also 1/2" AND I was waiting to buy a pair from them. I'm at a 6 gauge so I'm not too terribly far off. Aww I wish I still had my ears stretched! Sadly both plugs fell out while I was in the hospital and they shrank down so much! I'm so depressed about that lol.